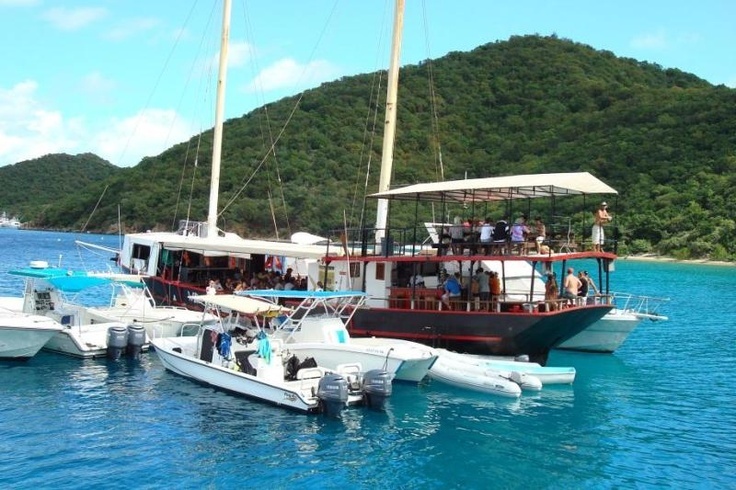 Willy T., a 93′ top sail pirate schooner replica, is one of the BVI’s famous destinations. It has been converted into a bar off Norman Island, aka ‘Treasure Island’. This legendary floating bar, which is also a dive wreck, is well known for it’s group wakeboard shots, great bartenders and good grub. Best way to get there is by boat and anchor yourself off The Bight. This is a popular stop for yacht charter guests, as their captain will bring them directly to the dock. If you like to swim, just jump off the boat and swim up. The daytime has a fairly family friendly atmosphere but beware, it can get a bit crazy without notice. If you are up for some excitement, stay into the evening hours, which can get a really wild. Many a person has jumped off the upper deck, in their birthday suit, into the crystal clear waters below. Sometimes, what happens at Willy T., stays at Willy T.!